Blog Quick Quotes: Little Flower Girl with Susie! Little Flower Girl with Susie! Hello and welcome! 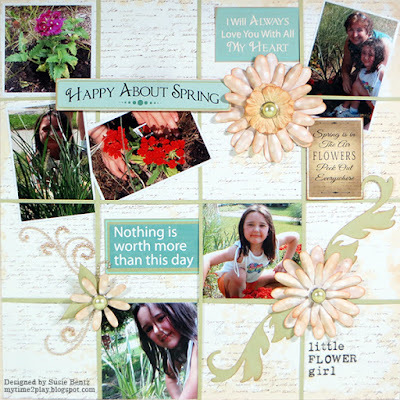 Susie here today sharing a Spring themed layout featuring the Chiffon Collection. One of my new favorite layouts to make are grid layouts. They are really simple and lots of fun! I loved the script design on one side of Chiffon 105 and used it for the background of the page. Next I cut 1/8" strips from Chiffon 104 and adhered them, with the green side up, creating 3" squares. Then I started to play with the placement of my photos and embellishments! The flowers are actually leftover from the February Club Q Kit, but you can die cut your own using Chiffon 100. I creased the all the petals, inked them with Creamy Cocoa and layered them together with dimensional adhesive. Before I added the pearl brad, I included a layer of silk flowers from my stash. ...and these fancy leaves frame this last bloom!